In Season Two, the Legends of Tomorrow will face off against the first ever team of Super-Villains: the Legion of Doom. With Season Three of DC’s Legends of Tomorrow, we find more time-traveling adventures. This three-disc set includes 21 episodes, a run that also features crossover programs from other DC series. The plot synopses come from the package’s liner notes. How can I dislike a show in which Julius Caesar gets stuck in Aruba? This episode launches S3 in a highly satisfying manner, with plenty of action and comedy along the way. Shades of The Greatest Showman! 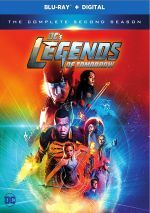 Barnum’s attempts to make the Legends part of his troupe add fun and overcome the semi-tedious romantic mopery between Amaya (Maisie Richardson-Sellers) and Nate (Nick Zano). The episode loses some points due to the terrible CG tiger it features, but overall, it’s another solid show. After trips to the past, “Zari” takes the Legends to the future. That’s less fun, honestly, and this feels like an expository episode, as it appears to exist mainly to bring the title character to the Legends. It’s still a decent show but it’s a dip in quality after the first two programs. Inside joke alert: at one point, Rory (Dominic Purcell) throws out the term “prison break”. This isn’t what you’d call subtle, since Purcell remains best-known for his role on Prison Break. As implied by the title, Legends embraces its inner ET via the super-80s tone of “Home”. The episode doesn’t overdo this, so the Spielbergian themes make it a fun ride. How can a show about a time-traveling vampire go amiss? Answer: it can’t, and “Mack” largely lives up to the promise of its premise. While the visit to classic Hollywood offers some fun moments, “Hunt” doesn’t quite live up to its potential. Still, it does enough to become a generally good show, if not a great one. I never much liked Grodd as a character, so an episode with him at the center seems likely to leave me cold. That’s largely true, though I do like the interaction between Rory and his dad. “Crisis” spans four episodes, each from a different series. “Part 1” appears in this season of Supergirl, “Part 2” comes from Season 6 of Arrow, “Part 3” brings us to Season Four of Flash and “Part 4” stems from Legends. That’s a pretty ambitious undertaking, and one that may bring minor spoilers for those of us who’ve not yet seen those other seasons, mainly via personal relationships. These don’t feel like egregious reveals, though. In terms of story elements, “Crisis” tends toward the sloppy side of the street. It throws a ton at us and not all of it makes a bunch of sense. Nonetheless, the “crossover event” manages a lot of good action, and it keeps us with it across the four episodes. While this doesn’t become a great package of shows, it offers pretty solid entertainment. With its callback to the “Tickle Me Elmo” craze, “War” manages a fun way to reset history. I’m not a huge fan of the Damien subplot, but this episode still offers more good than bad. Have I suddenly decided I like the Damien side of things? No, but “Darkest” holds up pretty well anyway, as the use of Constantine brings pizzazz. Though the use of the Groundhog Day conceit doesn’t seem original, “Here” manages to explore it well. The twists and turns entertain and make this a fun show. Hasn’t the series already done pirate shows? Maybe not – I’m too lazy to check – but the theme still seems stale. “Curse” milks it for some excitement but I just find it tough to get jazzed about a Blackbeard episode. Hey – a good episode that revolves around Damien! McDonough seems especially spry here, and the various time travel elements work even better than usual. So if Elvis doesn’t succeed, there’s no rock ‘n’ roll? That seems like a stretch, but if I ignore this questionable historical assertion, “Grace” works pretty well. Luke Bilyk doesn’t create a convincing Elvis but the show still entertains. By the way, there’s no Elvis song called “I’m Gone Mama”. Elvis’s actual debut was “That’s All Right”, and “Gone” offers a riff on it close enough to feel like it but not so close that anyone gets sued. I guess the series didn’t want to spring for the rights to “That’s All Right”! Though Legends usually opts for fairly comedic fare, “Stone” goes down a more horror-oriented path. It’s not the best-executed tale but I appreciate the change of pace. That “truth” offers a pretty lively plot twist, even if it feels derivative of other sci-fi efforts. Still, it’s a fun show that works well overall. Inside gag misused: Noble’s presence here. He played Denethor in the Lord of the Rings trilogy and this episode reflects that in a potentially cool manner, but it ends up being more of a throwaway. That minor disappointment aside, “Guest” manages to push us toward the season finale fairly well. Unlike many of the other DC series, Legends manages to pursue an overall narrative while it still gives us episodes that feel “standalone”. 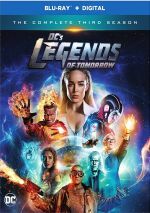 Recent seasons of Flash and Supergirl seemed to bury the viewer in the season’s arc, but S3 of Legends gives us programs that often see, “independent” even as they also progress the main theme. That makes S3 a lot of fun and satisfying as well. “Cuddly” ties together a slew of topics and brings a strong year to a solid end. 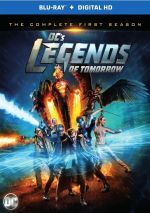 DC’s Legends of Tomorrow appears in an aspect ratio of approximately 1.78:1 on this Blu-ray Disc. The series offered positive visuals. Sharpness worked well, as only minor softness materialized here. Despite a handful of slightly ill-defined shots, the majority of the programs appeared tight and concise. I saw no signs of jaggies or moiré effects, and the shows lacked edge haloes or print flaws. If you suspected Legends would come with the modern standard teal and orange palette, you’ll get what you expected, though not to an extreme. The variety of settings meant a mix of other hues as well, all of which resulted in a relatively varied range. The colors looked nicely rendered. I also felt happy with the solid DTS-HD MA 5.1 soundtrack of Legends. A TV series won’t boast movie-quality audio, but the shows delivered involving material. Much of the track maintained a forward emphasis, but action scenes managed to use the back speakers in an effective manner. With the flying, explosions, battles and other components, the soundscape managed to pack a pretty good punch. Speech was always distinctive and concise, too. These mixes worked well for the series. 16 Deleted Scenes come from 10 episodes. We locate clips from “Helen Hunt” (2 scenes, 1:39), “Welcome to the Jungle” (1, 0:46), “Crisis on Earth-X; Part 4” (1, 2:02), “Beebo the God of War” (2, 3:07), “Daddy Darhkest” (1, 0:54), “No Country For Old Dads” (1, 1:00), “Amazing Grace” (4, 3:39), “Necromancing the Stone” (2, 1:44), “Guest Starring John Noble” (1, 2:33) and “The Good, The Bad and The Cuddly” (1, 0:38). That’s an ample selection of unaired material, and much of it seems enjoyable. Will you find real “lost treasure” here? No, but the clips are good enough to merit a look. Disc Two brings us Inside the Crossover, a 41-minute, 59-second program that involves Arrow executive producer Marc Guggenheim, Flash executive producer Todd Helbing, Legends of Tomorrow executive producer Phil Klemmer and Supergirl executive producer Robert Rovner. The show runners go over various aspects of the “Crisis on Earth-X” episodes and all their complications. Much of this leans toward happy talk, but we still get a pretty decent overview of the challenges and production details. On Disc Three, we locate a Gag Reel that lasts seven minutes, 28 seconds. It generates the usual mistakes and silliness. Some of it entertains but seven-plus minutes of this material feels excessive. Two more featurettes show up, and we get The Time Calibrators: Legends Assemble!, a 17-minute, 52-second piece. It provides notes from Klemmer. The show runner throws out specifics about a mix of episode elements, with an emphasis on supernatural characters and effects. While the featurette tends to feel a little disjointed, it brings enough useful info to merit a look. Post Production Theater lasts six minutes, 12 seconds and shows shots at various stages of visual completion. It’s a nice look behind the scenes. Finally, we locate The Best of DC TV’s Comic-Con Panels San Diego 2017. This compilation goes for 58 minutes, 27 seconds and involves Supergirl’s Jessica Quellar, Robert Rovner, Katie McGrath, David Harewood, Jeremy Jordan, Melissa Benoist, Mehcad Brooks, Chris Wood, and Odette Annable, Arrow’s Wendy Mericle, Stephen Amell, Emily Bett Rickards, Rick Gonzalez, Juliana Harkavy, Katie Cassidy, David Ramsey, Willa Holland, Echo Kellum, and Marc Guggenheim, Gotham’s Cory Michael Smith, Ben McKenzie, Erin Richards, John Stephens, Camren Bicondova, Robin Lord Taylor, Drew Powell, Jessica Lucas, Sean Pertwee, and Alexander Siddig, Flash’s Grant Gustin, Todd Helbing, Keiynan Lonsdale, Jesse L. Martin, Candice Patton, Tom Cavanagh, Danille Panabaker, and Carlos Valdes, and Legends of Tomorrow’s Marc Guggenheim, Franz Drameh, Victor Garber, Maisie Richardson-Sellers, Tala Ashe, Dominic Purcell, Nick Zano, Caity Lotz, Brandon Routh and Phil Klemmer. In each segment, we get some general thoughts about each of the series. They tend to be fluffy and mainly oriented at promotion and praise. While Flash and Supergirl stumbled recently, DC’s Legends of Tomorrow continues to chug. Season Three lives up to the high standards of its first two years to bring a strong roster of fun, exciting shows. The Blu-rays boast very good picture and audio as well as a decent smattering of supplements. Fans will enjoy this high-octane package of episodes.